Micro-needling (collagen induction therapy) using the Edermastamp offered by Mederm Esthetics & Laser is a gentle, minimally invasive treatment to rejuvenate the skin. The Edermastamp is a state-of-the-art European dermo-cosmetic device and first of its kind manufactured in Germany. The Edermastamp is the result of 30 years of scientific research, advanced technology, precision engineering, scientific clinical studies and practical use combined with numerous published reports showing impressive results in skin physiology. Dermaroller products are exclusively distributed in Canada and Mederm Esthetics & Laser is proud to be among their supporters. and gain a multitude of benefits to help restore your skin to its youthful glow. With repeated treatments, you get increasing benefits such as improvement in skin thickness and a more transparent epidermis reduced wrinkles and fine lines for a more youthful appearance. How Does the Edermastamp Work? It is proven to stimulate both neo-collagenases and neo-angiogenesis. This combination creates a more youthful, firmer and healthier-looking skin. Because it is the only LNM, it guarantees a precise number of micro-needling for a quicker, safer healing process without any tearing. It promotes the stimulation of new healthy tissue growth. There are four major phases created by physiological wound response using the Edermastamp. Day 1-3. An inflammatory response that promotes chemotaxis and proliferation of fibroblast. Debris and bacteria are removed by the Platelets during this cell migration. It is in the first phase the next proliferation is stimulated. Day 3-5. The proliferation continues and multiplies for the new fibroblasts, monocytes, and keratinocytes. During this phase, new collagen is laid down and new tissue creation is formed. Days of 5-20. Next fibrotic response occurs and growth factors are released with fibroblasts releasing more new collagen. 28 days-1 year. New, healthy skin occurs during the final maturation stage. An 80% of mature collagen and new tissue matrix is formed and stiffens for strength and youthfulness. What Main Benefits Will I See? 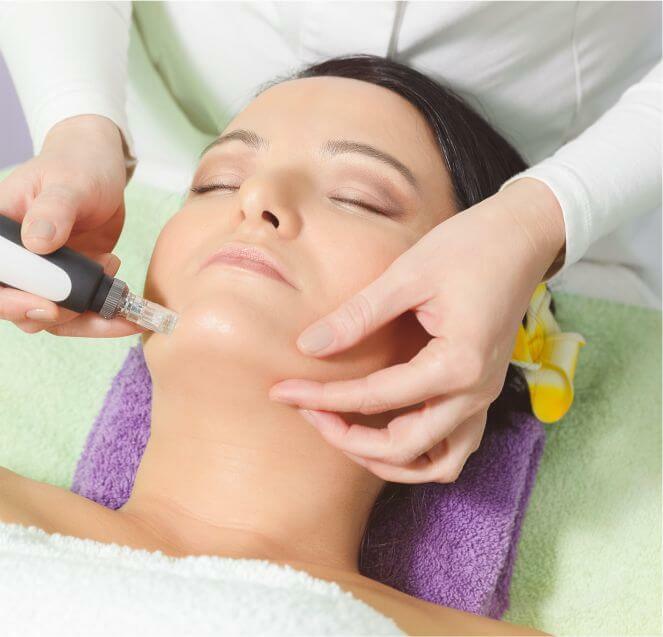 You will see a reduction of fine lines and wrinkles in addition to better tone and tightening of sagging skin. Scars and stretch marks will diminish. You’ll also notice a reduction in enlarged pores plus a lifting and smoothing out effect on the sun-damaged skin. An overall improvement in skin pigmentation will be evident for a younger, smoother and vibrant appearance.